I think the Lord may have wanted to encourage me this morning as I opened my Bible to the book of Romans. The Lord sees what is in my heart. He sees what is hidden from my eyes, and what may be hidden from the view of others as well. Life can be both beautiful and difficult. Each day is filled with wonderful blessings from God. There are also days that include hardships. Hardships as tall as brick walls that you run into and they can become discouraging road blocks. Have you had struggles in your journey that lasted way longer than you expected? Have you been hindered or delayed from reaching your goals, calling or duty? In 2001, an automobile accident interrupted the lives of our family. In fact, it more than interrupted, it changed our lives forever. My husband, Jerry, was knocked unconscious and suffered whiplash. Eight years later, the effects of the untreated whiplash progressed to spinal stenosis in his neck and required surgery to correct it. The surgery went well, but tragically, a blood clot caused his death two weeks later. The detour of our automobile crash occurred just two weeks before my daughter Rachel’s fifteenth birthday. She suffered much more than my husband or I. Her head injury quite severe. She needed an emergency last-ditch brain surgery to save her life. Afterwards, she remained in the hospital five months to relearn how to swallow, eat, speak, dress and eventually walk. The near fatal accident impacted her emotionally, mentally, and physically. It has been a challenge balancing the responsibilities of a full-time caregiver, mother, and guardian throughout her miraculous recovery these past fifteen years. More so has been widowhood these last seven years. I have struggled to care for an older home set in beautiful park-like surroundings as I’ve juggled the special care she requires long-term. Sometimes I’m able to accomplish what I need and/or want during the week within the few hours she is away at a supervised work or recreational care facility. Others times, the reality of living with the effects of a Traumatic Brain Injury break-up that much-needed respite. I should be used to the setbacks. I should be a pro by now, right? Recently, I hit a “chuck-hole” in my journey and discovered I needed more perseverance. Last week, I bought paint for the exterior window trim. The next day, I re-injured my foot and strained the tendons in the back of my knee as I reached out to help some one. Really?! I waited a year as my foot healed and gradually returned to physical activity. It had only been a month since I was able to walk on the soft cushion of the lawn and ride my bike up and down the road for 20 minutes. The hobbling saga aside, the windows needed attention three or four years ago. The neglected wood trim was weathered and had dry rot in places. The caulking was cracked and falling off. The scraping, repair and painting of the window trim I planned to get done, was pushed aside while I attempted to manage the bump in the road consisting of phone calls from nurses and staff regarding the “seizure-quo” activity occurring in the last few days. My daughter began to grieve the loss of her step-dad with the onset of seizures. I tend to drive myself hard in order to finish tasks, and as a result, at times I’ve become burned out, depleted of joy, discouraged and parched. This detailed explanation sheds light on the poem, “Listen to the Rain” previously posted on A Beautiful Life website. I need to grow spiritually, grow more into Christ likeness, instead of complaining about my circumstances. I need to consistently praise God because, He is aware of all that goes on in my life. He doesn’t give me more than I can bear, after-all, he bears my burdens. His yoke is easy and his burden light. Matthew 11:28-30 (ref.) I need to respond with the power that is available to me through close communication with him. With his power, I’m able to have a mature attitude. Not an attitude with a capital A. Not a ranting, crying out to God for help in a dysfunctional way, as I try to cope with the challenges. My response of humble repentance has yielded a quiet character that hopes. My heart is renewed and filled with love poured out from God through the Holy Spirit. From perseverance to harvesting hope. It’s harvest time. When we harvest hope, others can also hope to grow into the person God intended them to be. Beautiful inside and out, because God desires to make something beautiful out of our lives. Let us be an encouragement to one another. Have you been challenged recently with road blocks in your life? Have you repaired any windows lately? Perhaps you’ve a story to share of how God closed one door and opened a window of opportunity. Incidentally, I finished most of the front windows of the house without breaking them or falling. Praise the Lord! 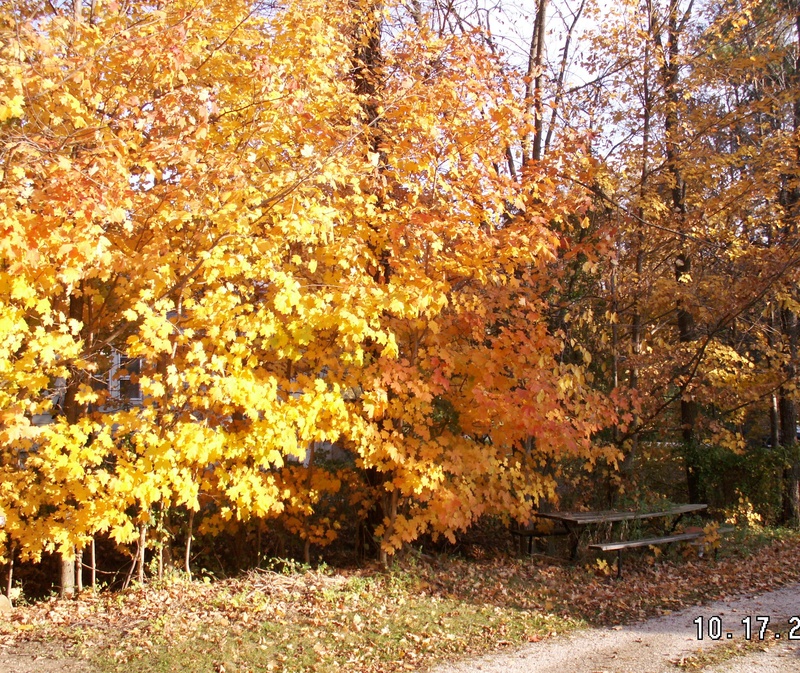 With Autumn’s abundance come the showering of leaves the trees shed. 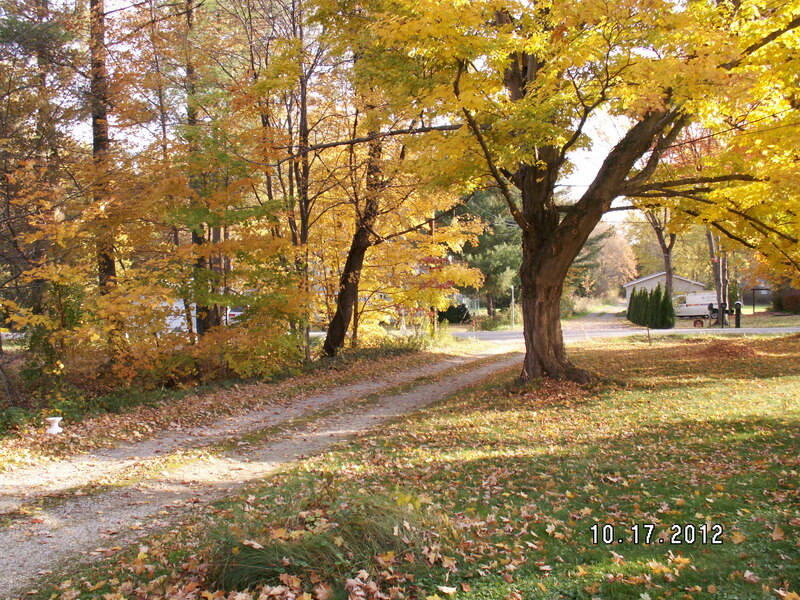 The maple trees bordering one corner of my property seemed to have been rather abundant this year. I had a carpet of 2-3 inches of that abundance that raked into 2-3 feet piles. My neighbor had been watching the leaves that were from another neighbor’s property, shower onto my property. 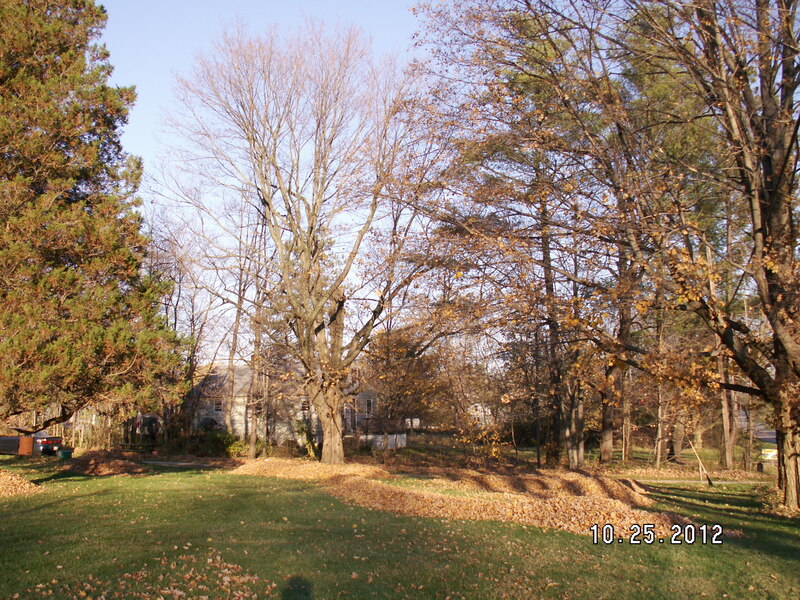 I thought there had been more this year than I had ever raked before. I won’t be stingy, though. I am more than willing to share the abundance with whoever may need a few…thousand…of the thousands. I think there will likely be an abundance of leaves since they will be used for the healing of the nations in God’s Holy and Eternal Kingdom. 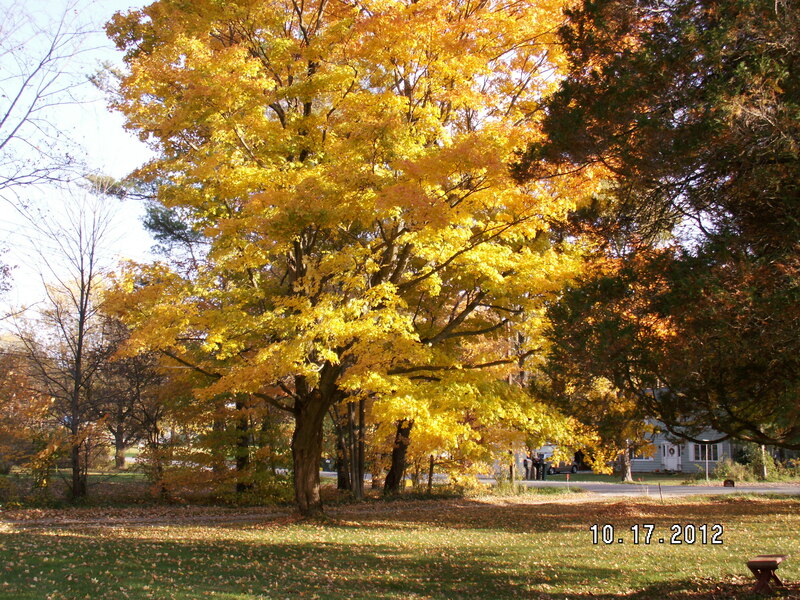 After seeing Jesus, one of the things I am looking forward to seeing when God takes me to heaven is the tree of life with a blessed abundance of “healing” leaves. Today would have been my late husband’s birthday. I may not be able to celebrate Jerry’s birthday, but I know we will celebrate a greater day when together with the Lord in Heaven. In my last post, I promised to tell you how you can have abundance. What is Abundance? 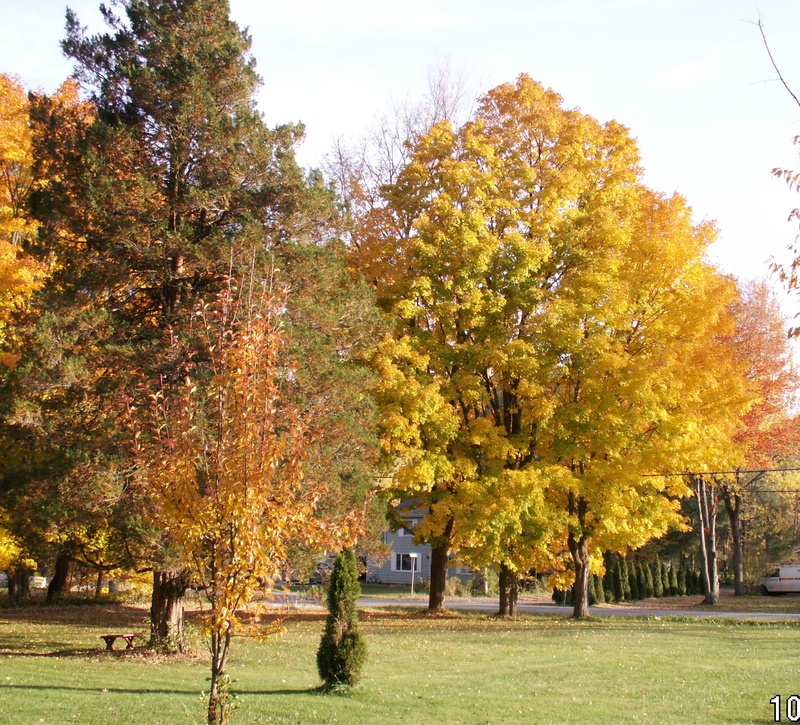 The picture above is an example of abundance. An abundance of blackberry fruit. Similar to the blackberry abundance, is spiritual abundance. To understand this concept better, I opened my Bible to the 15th chapter of John. He didn’t say a little fruit, he said “much fruit”. That’s abundance. Staying connected to Jesus is the key to abundance in our spiritual life. In my next post I will expand in more detail how you can stay connected to Jesus and “bear much fruit”. 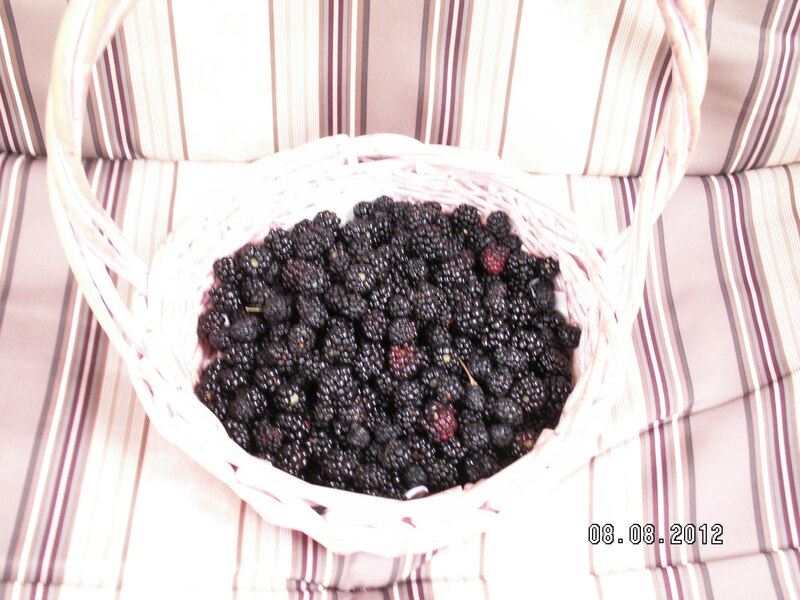 Yes, as you might guess from the picture of berries in this basket, I’m still picking blackberries. But, as I promised to tell you in the earlier post, this is what I’ve done with the bounty so far. I baked cobblers, a blackberry kuchen served with a scoop of vanilla ice cream and warm peach sauce, blackberry bars and made blackberry jam and jelly. What an abundance of fruit! Do you know we can have an abundance in our spiritual lives too? 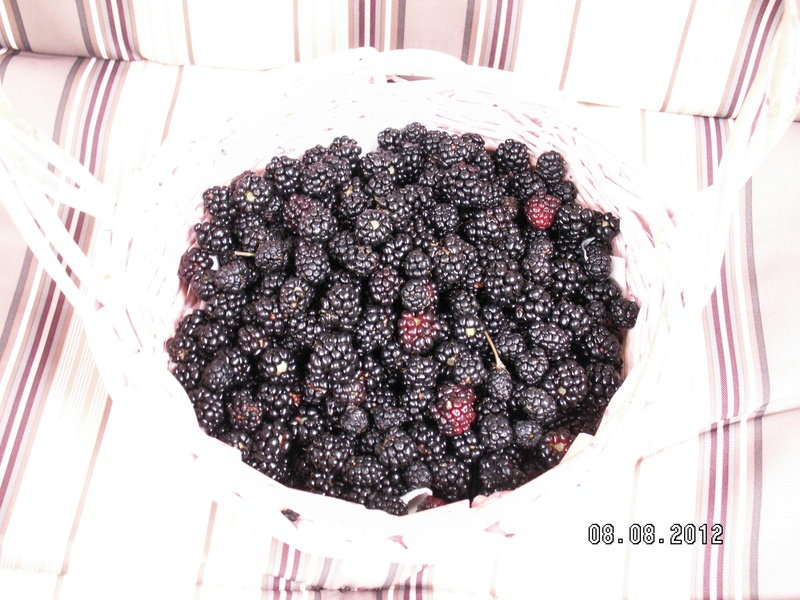 In my next post of the Blackberry Harvest, I will tell you how you can have abundance.